Howdy Hoo Jaderbugs! 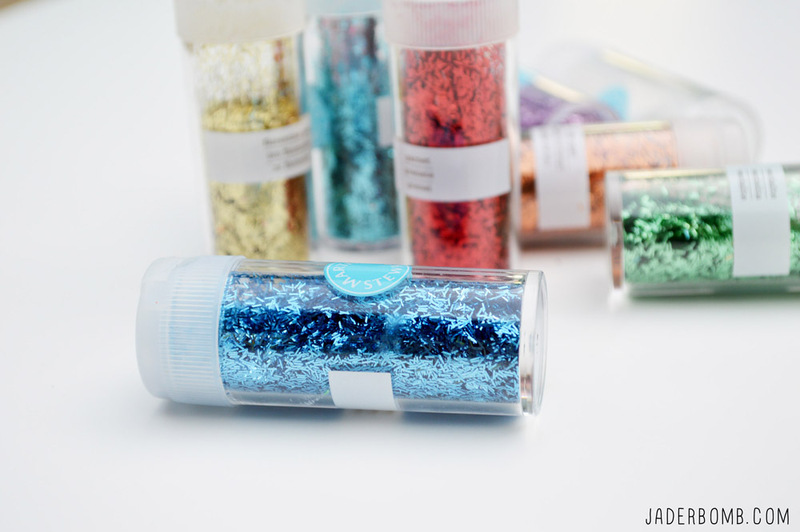 It’s Monday and I have a ton of glittery happiness for you. Well not technically a “ton” but you understand. 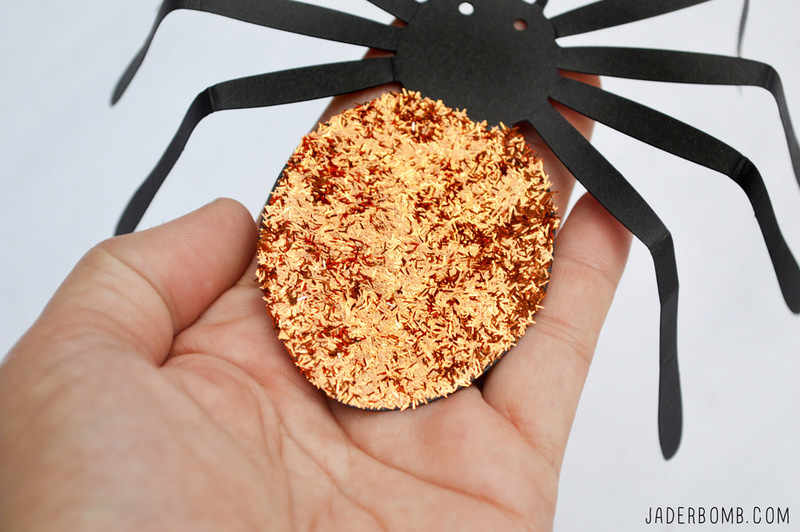 It’s all about “Halloween Decoration Ideas” today on the blog. I don’t know if I ever told you just how much I love Halloween and fake spiders. Preferably black ones made of paper. The one thing that is changing as I am getting older is my Halloween color theme! I do still love the original orange and black but…COLOR makes me happy and jittery inside. I guess I am sorta like ROY G. BIV’S wife. I mean if she existed (wink wink). I am so in love with GLITTER. I am not speaking of a “normal” relationship with glitter. You will never find me without glitter. It’s either in my purse or in my hair. <—haha! 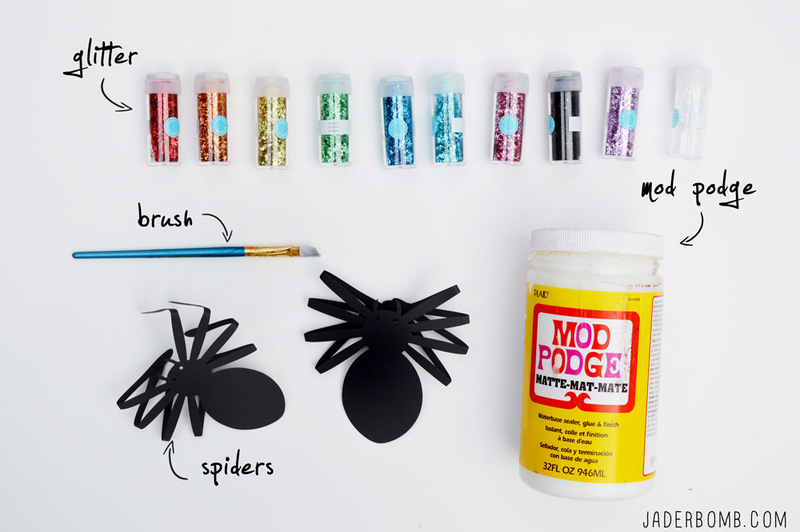 The first thing you will do is coat the bottom of your spider with Mod Podge. 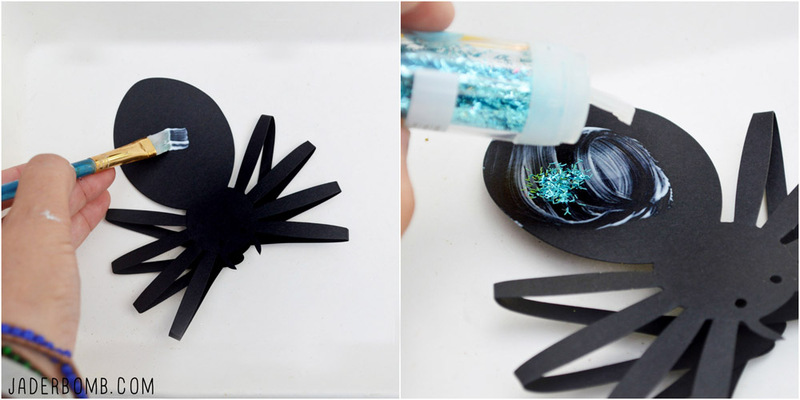 Quickly sprinkle the spider with glitter before the Mod Podge dries. I used the tinsel glitter because in the end it almost looks hairy. 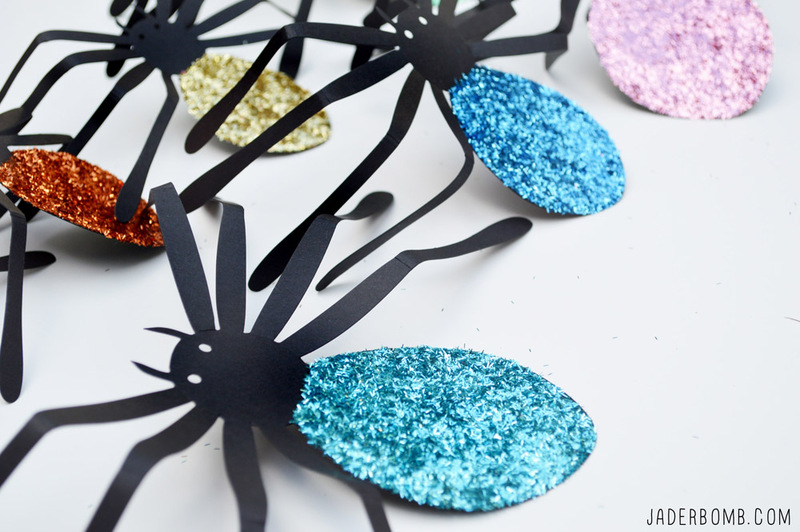 I think the tinsel glitter is a great choice to add texture to our spiders. I usually use this glitter around the Christmas holiday’s but I figured I would bust it out a little early. 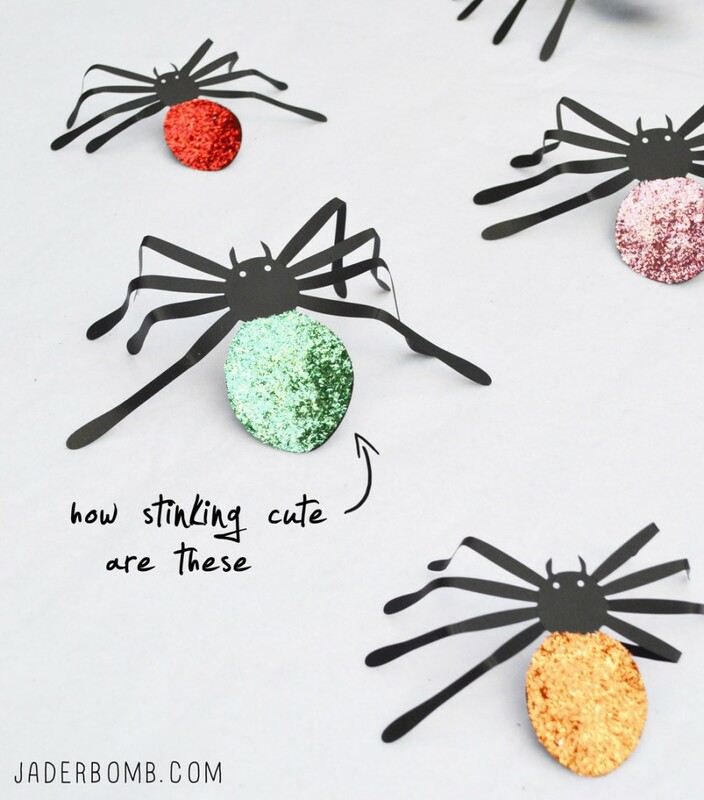 When you buy your paper spiders they come with little round double sided stickers. You will place them on the underneath and stick them on a wall. I absolutely love how they look full of color. PURE HAPPINESS. 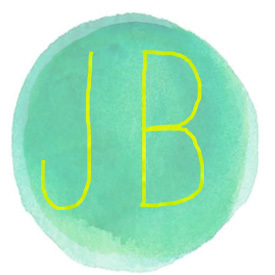 I hope you enjoyed this bright and fun tutorial. I would say this is on the “EASY” level but you know what…Sometimes the cutest things just cross your mind and I am here to bring them back! See ya in the next post! 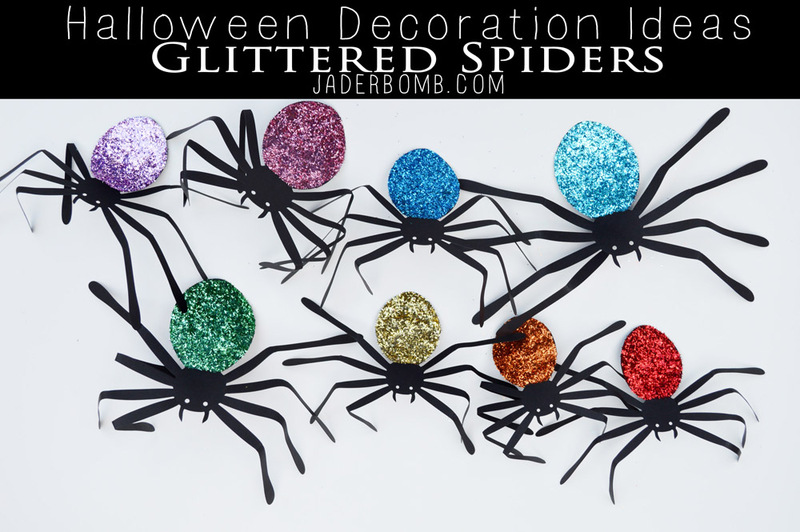 Every spider needs a little glitter – then nobody would ever step on them again! Thanks Kelly! They would be pets then!